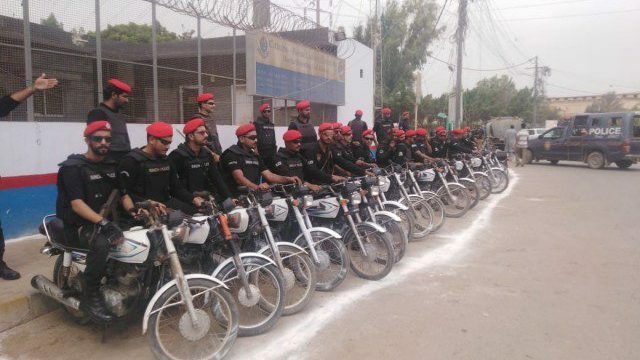 In an aim to curb street crime from District Korangi, the city Police have formed a specialized bike squad, namely the anti-street crime force. Street crimes have become a nuisance for the residents of Korangi and after many complaints of mobile snatching, and other robberies, the police has finally taken up the challenge to eradicate such elements from the area. As per the SSP, the new squad comprises of 100 personnel, trained by Army, and around 50 motorbikes. The squad will keep in touch with factory owners and other individuals to act promptly in case of street crime. Following the launching of the squad in the district, the street crimes will surely decrease, said SSP Korangi, while talking to Express Tribune. The district Korangi is divided into different beats, and each beat will be covered by two bikes and four respective constables, the SPP added. Aside from Korangi police taking action against the street crime, Attock police have recently busted bike lifter gang which was operating in KP and Punjab. Moreover, not so long ago, the Anti Car Lifting Cell Karachi (ACLC) has also arrested two professional bike lifters. The culprits, in 25 years, had stolen over 2000 bikes in the city. The criminals also claim to have received 5000 per each successful bike robbery. The law enforcement agencies, across the country, are cracking down on criminals to give relief to the people of the country.